Today I’m not sharing about works in progress – knitting (still the test knit, still going ok) or reading (listening to One Hundred Years of Solitude and loving it). Today is about the summer queues. Items 6 and 7 (not shown) are cowls. Putting them in the Nice to Have category so as not to give myself too much pressure 😉. I have 11 weeks. It seems doable. So glad to have Kat’s KAL to keep me focused! 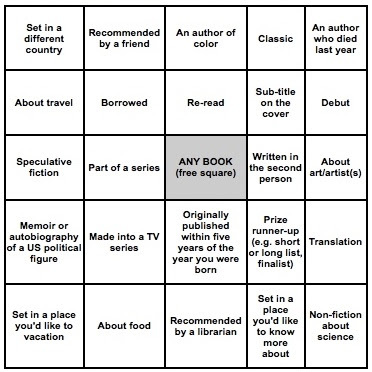 On the reading front – it’s Bingo! I have books earmarked for all the squares except the middle one. Figure that gives me some flexibility – I’m sure some book is going to come along between now and Labor Day that I’ll just have to read! As I’d hoped, I didn’t have to s-t-r-e-t-c-h any of the squares to fit something I’d actually want to read. …at least not much! I have Mill on the Floss for “Recommended by a librarian”. That one came recommended by my friend Carole, who just happens to be a librarian. And A Conjuring of Light (the 3rd and concluding book in V.E. Schwab’s Darker Shade of Magic series) is certainly “Set in a place I’d like to know more about” … it just doesn’t happen to be a real place! And finally there’s Day Drinking (a recent gift from my sister) which is “50 cocktails for a mellow buzz”. Surely y’all would agree that’s “About food”? 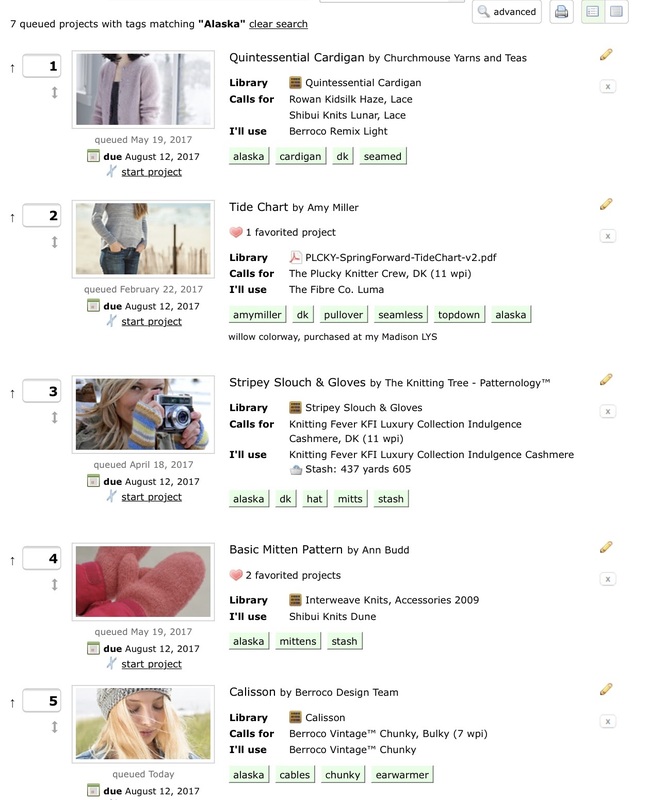 With all the knitting I have planned, a lot of these are audiobooks (10 total), but nine are real books. That’s probably more “real book” reading than I’ve done in a long time – and a whopping seven of those are books from my own shelf (two are re-reads). I’m only buying one, Jabbok. It comes highly recommended from a friend who lives in Alabama, where the author is from. I couldn’t find it at the library, but I have a feeling this is a book I’ll be happy to own. And that’s it – lots of plans … and a whole summer to make them happen! 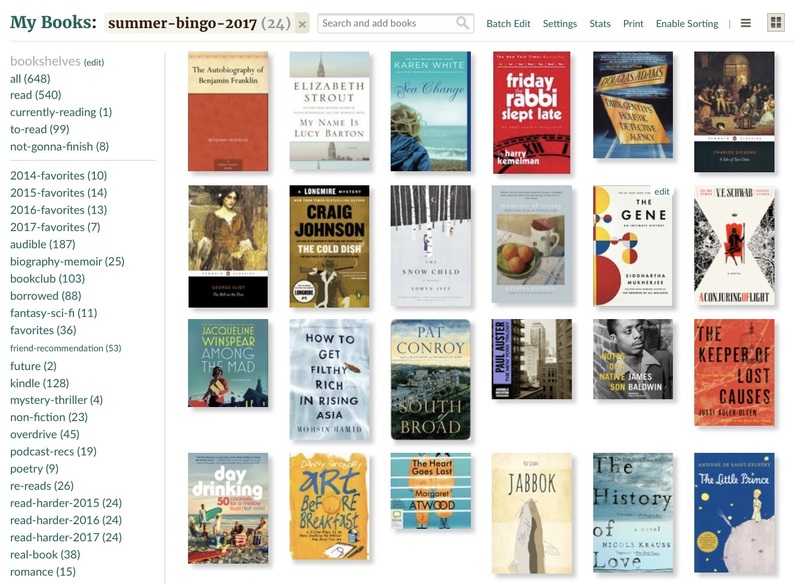 I’ve really enjoyed reading about what so many of you have planned for summer reading. It’s going to be fun to follow and cheer along! Same with the knitting. Thank you Kat, for bringing us all together! 10 books I’d recommend to a friend. That looks like an ambitious queue, but as you are one of the most prolific knitters I know, I bet you can do it! I've also enjoyed SBB planning, buying only one book so far and leaving a few squares empty, but I'm sure the right books will present themselves. With Dirk Gently, The Snow Child, The Gene (and Day Drinking!) you've got so much to look forward to! You have indeed set an ambitious knitting/reading agenda for the next two+ months and as Bonny sez: If anyone can meet the goals, it's truly you! Knit and Read on! Yikes! That's a ton…but all good, and I agree with everyone else. If anyone can do it, it's you!! Have fun and get busy knitting and listening!! Wonderful books & knitting projects! My goal, slow knitter that I am, is to finish the shawl I'm knitting for my niece by summer's end! Have fun! Wow! You're going to have a busy summer. Your trip to Alaska sounds exciting & I love the projects you've picked to knit for it. You and Kat have well planned summers! I love your queue! I'm going to be flying by the seat of my pants for both the KAL and Bingo. I just commented on Bonny's blog that planning the reading for the bingo card is half the fun and I'm glad to see you feel the same way. I don't have any specific summer reading planned, though, and I'm okay with that. I love the knits you have picked! And, those books! Gah! This is going to be the BEST SUMMER!! So many lovely knitting projects! And what a great line-up of books! After reading about Jabbok, I think I might have to add it to my collection. You always give me something to ponder Mary! It's going to be a great, great summer! I need to fill in my bingo card! I need to get moving on knitting and reading, but first-let's wake up from the nap and finish the cocktail Katie made for me after lunch! Thanks, Mary! That will work!